To register please use this form: Family Camp 2019 We will calculate the cost for your family and get back to you. International Family Camp is a wonderful chance to bring meditation and the Shambhala teachings into family life, and to give parents and children a chance to soak in an atmosphere of mindfulness and awareness. Join us for this vibrant time at the height of the summer! Playing, practising and exploring nature, parents and children have time to spend both together and apart in a creative and gentle adventure. In the mornings, parents will have the opportunity to meditate, study and share on common topics with each other. The teachers will lead morning sessions each day which include talks, meditation practice and discussions. Afternoons are designed as family time and will offer structured group activities for the entire family. 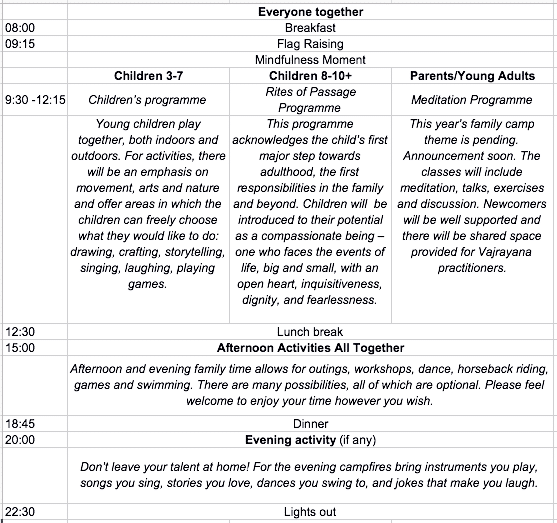 There are four streams of activity happening during Family Camp : Family time, Children’s programme, Parents’ programme, and Rites of Passage. Please be aware that children and parents will participate in the different portions accordingly. See the below schedule. Note that separation happens during the morning session only. Of course, parents are welcome to visit the younger children’s programme, and likewise sometimes the youngest children prefer to sit with mummy and daddy during their class. All engagement in afternoon/evening activities is optional, however participation in classes and meditation practice is highly encouraged for parents, in order to get the most out of this retreat. Children aged 8-12 have the opportunity to join the Rites of Passage programme. Click here to find out more. For Children over 10 years old who don’t want to join Family Camp – Check out Sun Camp! In the same period, Shambhala Sun Summer Camp, an independent children’s programme for children aged 10-16 is run on the nearby land of Dechen Chöling. Sun Camp is a sleep away camp for youngsters across Europe and beyond. This week is filled with opportunities to have fun, make friends and learn to take responsibility for oneself and one's world. End of programme (Friday August 16): Ends with a festive family banquet in the evening. Departure day (Saturday August 17): You may leave anytime (no programme). You're welcome to stay for lunch. * This programme is not accessible to children below 3 years old. However, they are welcome at Dechen Chöling, under your responsibility. If you bring a nanny or au pair, they pay 20 euros per day. Please follow the registration form which guides you in registering more than one person. Thank you!